When life gives you lemons (or your neighbor does as mine did), preserve them. That’s what I did this weekend and it took me about 20 minutes. That’s because you don’t have to “can” these the way you do other preserves – there’s no boiling of jars or lifting with tongs or popping of lids. 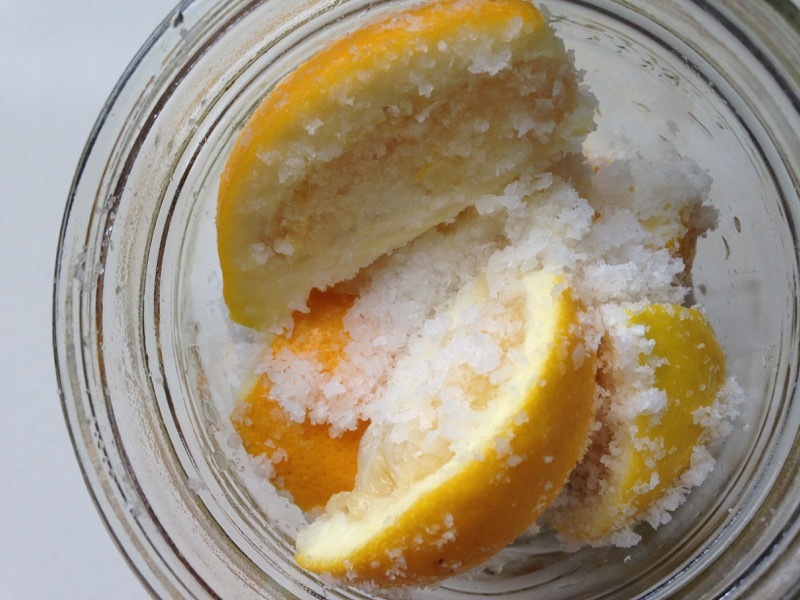 All you do is toss lemons with kosher salt and stuff them into a jar. Then you wait 3 weeks for the lemons to cure to the point where you can dice the peel and use it as a salty-tart condiment for a Moroccan tagine or braised chard stems. Once you get through that first period of waiting, preserved lemons can be stored in the fridge for several months and they only get better and better. but a chef gave me the tip that you can just cut them apart and toss them with salt in a bowl and the whole process will be much faster and the results essentially the same. Then you pack the lemons – I mean, really STUFF them – into a clean jar. Pour in lemon juice (and top off with boiling water if you need to fill the jar; this accelerates the curing process too)…at this point you can doll up your jar with a pretty ribbon or you can slide a bay leaf (preferably a fresh unsprayed bay laurel leaf) inside the glass for a swashbuckle of color. Then let the lemons sit on your counter for a week, shaking the jar every day (or a few times a day) to keep the salt from settling on the bottom. Transfer them to the refrigerator and in 3 weeks, the peel will be softened enough to use as a condiment. Of course you can use them in Moroccan and other North African recipes, or to sprinkle on fish, toss with sautéed broccoli rabe or greens or roasted eggplant, or splash the brine into a dirty martini. So much more fun than turning lemons into boring old lemonade. Wash a 1-pint glass canning jar and lid well with hot soapy water, then rinse. Cut 6 of the lemons into quarters. 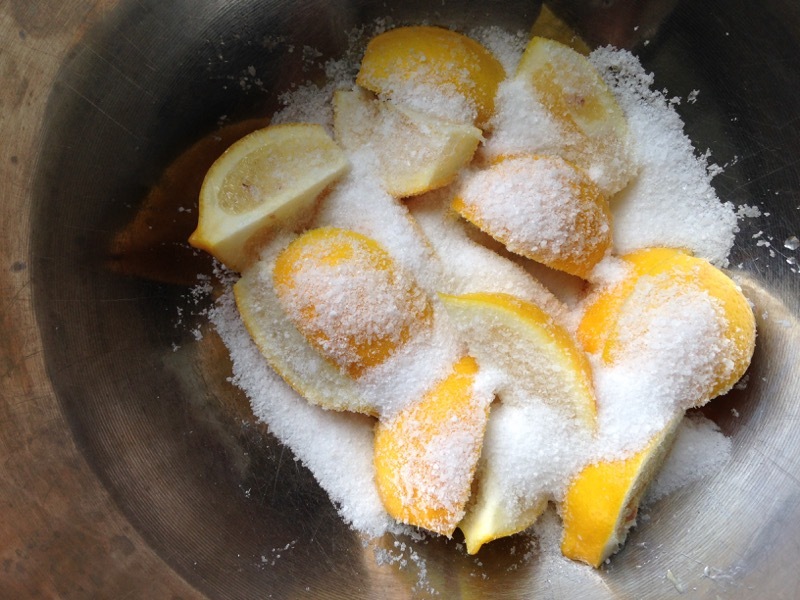 Put lemon quarters in a bowl and sprinkle with the salt. With your hands, toss, toss, toss the lemons and salt until everything is well coated. Pack lemons tightly into the jar by pressing down on lemons as you go and filling all the way to the top. You may ending up not using all the lemons or using one or two more, depending on their size. Squeeze juice from remaining lemons and pour into the jar. If you don’t have enough lemon juice to fill the jar, boil water in a kettle and pour into jar until liquid comes right up to the rim. 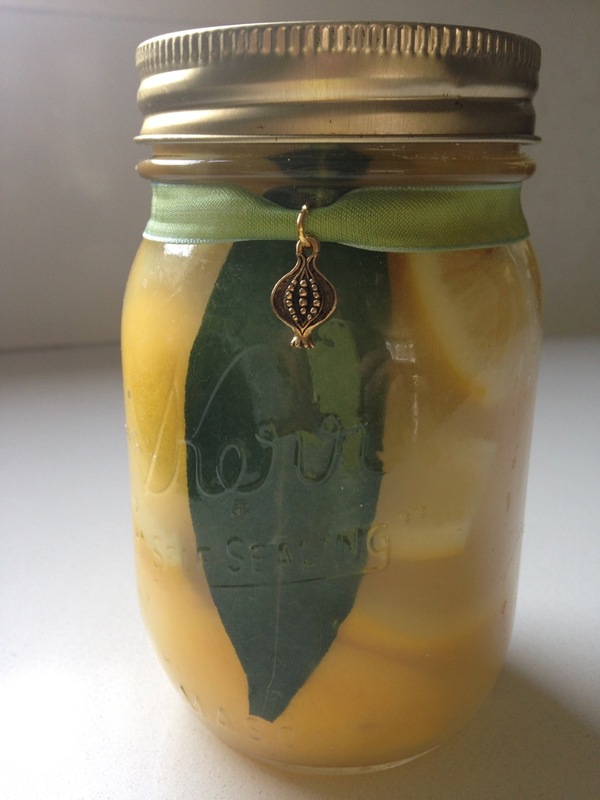 If desired, slide bay leaf inside of the jar between the lemons and glass. Screw on lids and shake jar well to help salt dissolve. Let stand at room temperature, shaking well every 12 hours, for 1 week. After 1 week, transfer jar to the refrigerator. Lemons are ready to use after 3 weeks and keep up to 3 months in the refrigerator. 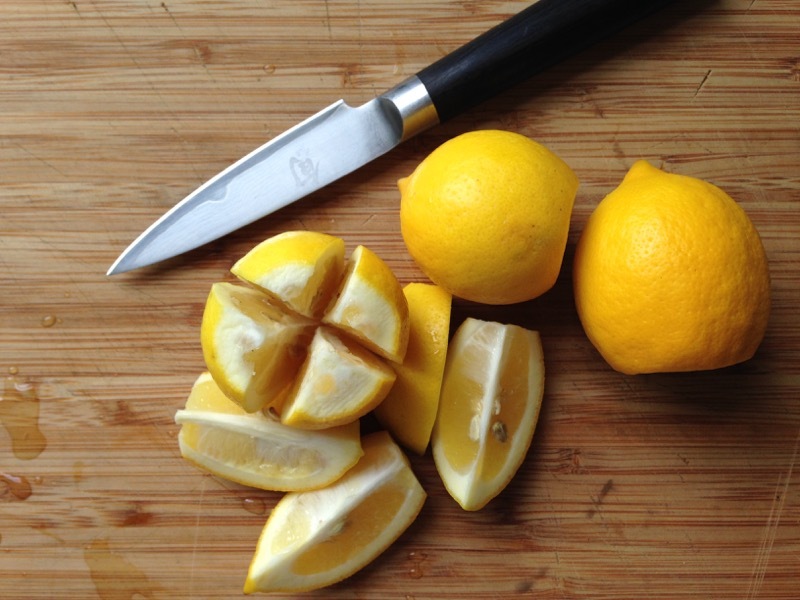 To use lemons, pull out a lemon quarter and chop or slice peel as directed.